Americans’ right to publish free from government interference is contained in the Constitution’s First Amendment, which was adopted in 1791. In the past 50 years, all manner of publications have relied on it in major court cases, ranging from the New York Times — which has used it as a defense against claims of libel — to Hustler magazine — which has used it as a defense against charges of obscenity. But what did the founding fathers have in mind back in 1791 when they made freedom of the press a centerpiece of the First Amendment? They certainly were not thinking of radio or television. Neither had been invented yet. Nor were they thinking of big daily newspapers, such as The Times. They didn’t exist either. There was no way to produce large-circulation newspapers back when presses were hand-powered. Mass-circulation newspapers weren’t possible before the first half of the 19th Century when — in the wake of the Industrial Revolution — steam-powered and then rotary presses appeared. Nor was Congress thinking about men’s magazines, such as Hustler. There’d be no reason to before cameras were invented, and the earliest form of photography, daguerreotype, debuted in 1839. The “press” America’s founding fathers sought to protect in 1791 consisted of weekly newspapers, often with circulations under 500 because that was the most that could be produced in a week’s time. These tiny papers were considered so crucial to America’s emerging democracy that nine of the original 13 states independently passed freedom of the press laws before Congress passed the First Amendment. A dramatic example of the value that American colonists placed on their outspoken, highly partisan little newspapers occurred in 1765 when the British Stamp Act imposed a tax on newspapers and business documents, thereby shutting down many colonial newspapers. The public was furious. John Holt, the owner of New York’s Weekly Gazette and Post-Boy, found a warning letter thrown through the door of his print shop. “We are encouraged to hope you will not be deterred from continuing your useful Paper by groundless Fear of the detestable Stamp-Act,” the letter said. “However, should you at this critical Time shut up the Press and basely desert us, depend on it, your House, Person and Effects will be in imminent Danger. We shall therefore expect your Paper on Thursday as usual.” Needless to say, Holt continued publishing. It’s worth noting that despite today’s widespread calumny that “newspapers are dying,” most are not, and weeklies in particular are holding up well. Because thousands of US communities are too small to get regular coverage of local news from television and daily newspapers, weekly newspapers have a total nationwide circulation far larger than many people realize. There are approximately 1,400 daily newspapers in the US. Together they have a total circulation of about 42 million. In contrast, there are well over 6,000 community newspapers, mostly weeklies, and they have a total circulation of roughly 65 million. All this according to the National Newspaper Association (NNA). Unlike daily newspapers, weekly newspapers are not discarded after a day. Most weeklies sit around the house for several days with various household members picking them up multiple times. As a result, weekly newspapers are read by an average of 2.3 people per household, and they typically spend 38.95 minutes a week with each copy, meaning that 150 million people read a community newspaper almost 40 minutes a week, NNA reports. Local news is the most-frequently read topic, and 73 percent of community-newspaper readers report reading all or most of each issue. To be certain there are an increasing number of web-news sites, many of them maintained by newspapers, but their readers average only 4.4 minutes per visit, according to NNA. It’s also worth noting that 30 percent of adults who live where community newspapers circulate have no Internet access at home. At 4 p.m. this Sunday, April 27, I’ll have more to say about the weekly press at Book Passage in Corte Madera. 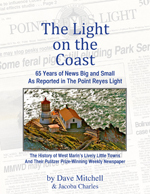 I’ll also read from my new book, The Light on the Coast: 65 Years of News Big and Small as Reported in The Point Reyes Light. It consists of news reports published at the time events were occurring plus a background narrative. The Book Passage store where I’ll be speaking is located at 51 Tamal Vista Boulevard just north of Century Cinema theaters. Sparsely Sage and Timely is powered by	WordPress 4.9.10 and delivered to you in 0.379 seconds using 52 queries.